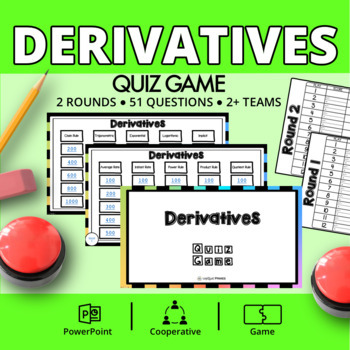 Derivatives Quiz Game includes all you need to run an exciting Jeopardy Style Math Game and review Derivative Rules at the same time! The Quiz Game PowerPoint contains 2 Rounds of 5 Categories each containing 5 questions and 1 Final Round with its own unique Category and 1 question. The Team Name Plates can be printed using duplex printing, and are intended to be folded in half to create name tents for each Team. They also act as individualized scoring cards for the Teams. The Teacher Scoring Card is included for you to keep track of Team's individual scores as well. Finally, the Teacher Answer Sheet has been provided for you to reference when students answer the Questions in each Category. You may check this Answer Sheet first to see if the Team is correct before proceeding onto the Answer Slide of the PowerPoint to allow for other teams to answer the question if the first Team gets it wrong. All materials are created in ultra high resolution! Look for more Review Games on TPT by Unique Primes!